SEOs in the US (and most other English speaking countries) have gotten accustomed to relying heavily on Google and Bing for backlink data. Because of that, few SEOs pay attention to the Russian search engine Yandex. And even fewer are aware that Yandex provides free backlink data straight from their webmaster dashboard. But to me, the coolest thing about Yandex is they have an awesome API that makes exporting backlink data easy as pie. SEOkicks is a German tool that claims to have it’s own index of around 42 billion URLs. I really like how easy it is to use and the ability to instantly export into a CSV. The data set includes the domain’s IP address along with Moz’s Domain Authority metric. The only down side to this tool for us Americans, is its written completely in German. So you might have to use an online translator to get the full experience. Ok, so I know what you are thinking, “um, Joe, Google is not alternative“. That is correct, however, based on how little I see Fusion Tables used, I would say it is pretty alternative. For those of you that don’t know, fusion tables are an amazing way to visualize data. Using them to analyze backlinks allows the SEO to see complex relationships between sites. Also if you need a visualization to make your client say, “Wow!” this is the tool to use. Like Google’s Fusion Tables, Gephi is a great way to build dramatic visualizations of a backlink profile. This tool is designed to chart graphs, so it is the ideal solution for showcasing networks and link relationships. One cool aspect of the visualizations is they can show both link connections and other metrics at the same time. Setting it all up can be a bit confusing, but Justin Briggs has a great post that walks you through all of the complicated steps. New Free SEO Tools from WBP – Sweet! 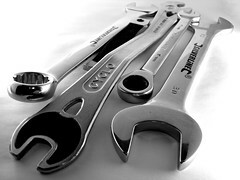 @joehall Just made your life easier with 5 Alternative Free Backlink Analysis Tools: http://t.co/pM4pXxpVwz Thanks Joe! What matters is the backlinks indexed by Google and they do not tell us directly. PageRank is the only indication of the incoming links to a webpage that are indexed by Google and their value. Hi Mike, thanks so much for letting us know! Site seems to be loading now. Please let us know if you encounter any other problems! Given that most backlink analysis tools are not free, having free options is a great thing! Thanks for the list 🙂 Great help! Excellent article – 5 Alternative Free Backlink Analysis Tools http://t.co/4RWZo8h3X9 b @joehall #SEO Please Share! Nice collection of tools and I didn’t knew any of them up until now – so thanks a lot! Btw: SeoKicks is available in English now and it’s really an awesome tool.